Algal communities were compared among benthic and net plankton samples from Cape Maclear, Lake Malaŵi. In the cool mixing season (from May to August), rocks were overgrown byCladophora orCalothrix, accompanied by the diatomsRhopalodia, Cymbella, andNavicula. These diatoms, together withEpithemia andCocconeis, were epiphytic onCladophora and macrophytes. In sandy areas, the common diatoms wereRhopalodia, Fragilaria, Epithemia, Navicula, Surirella, andMelosira. In all phytoplankton samples, taken with a 10 µm mesh net, cyanophyte cells were the most common (70 to 80%), especially those ofOscillatoria. Biomass, however, was dominated byPeridinium from November to April and byAnabaena andOscillatoria from September to April when the mixolimnion was stratified. Among the chlorophytes,Oedogonium was the most common, especially from May into December whenPleodorina became more common. Diatoms dominated the biomass in the mixing season (May to September):Stephanodiscus in May, followed byMelosira nyassensis and lanceolateNitzschia species from mid-June through August. For the rest of the year the epilimnion was stratified and theseNitzschia species were virtually the only diatoms present. Benthic and planktonic communities share few taxa: benthic taxa never made up more than 2% of cells in offshore tows. This conclusion contrasts with previous reports, especially regardingSurirella. Consequently, an abundance of benthic taxa in sediment cores may be interpreted as lower lake level if sediment redistribution can be excluded. 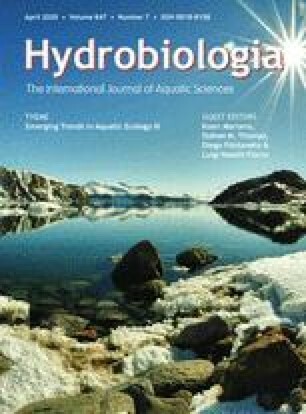 The seasonality of the planktonic diatoms is compatible with current ecological hypotheses, and therefore increases their value as paleolimnological indicators.